I am always on the lookout, not necessarily the search, for good food that I can find time to make. Even though I do not feel like I am super busy, time just seems to evaporate most days. During one adventure to the grocery store, I was inspired to buy some chicken breasts. I’m not sure why exactly. I usually walk right by that aisle as I prepare for what is sure to be a battle at the deli section (there are so many choices, strategy must be employed). Anyway, I picked them up, and stuck them in the freezer for X days (X was long enough that I forgot what X is, besides a number of course). Rinse chicken and place in ziploc bag. Cover with Italian dressing and marinate in the refrigerator for at least 4 hours or overnight. Preheat grill for high heat. Lightly oil the grate, then grill for 6-8 mins per side. It says to use high heat, but I found that I was actually just searing them and then creating a ton of smoke (if only I had glowies it would have been fun), so I used medium heat instead and it worked waaaaaaaay better. I like to cut the chicken breasts up into strips before marinating so they can soak up a little more. I’ve tried both regular italian dressing, and zesty, and both are good. The flavor is not very strong, but keeps them nice and moist. Now, I just couldn’t leave it with only having chicken. That is not much of a meal. I had, by chance, also picked up a very tiny rice cooker. It cooks about 1-1.5 cups of rice into 2-3 cups of rice. Really perfect for a small meal. Has a keep it warm setting when done so it makes it really easy so I do not have to worry about, omgomgomg don’t burn the rice, etc. So I was on the hunt for another recipe for some simple rice I can make. I found this really simple lemon rice recipe. I tend the fudge the numbers a bit when I actually make it (I’m pretty sure this is genetic). I do not think I use as much butter. I use about 1/2 tablespoon less lemon juice. And I through in a lot more herbs than just basil. I like to put int some oregano, rosemary, dill weed, and sage. Does it make a difference? Iuno, but it seems fun. I like the chicken broth for water, at least, I am assuming I use chicken broth in place of water? I mean, it matches up to what the rice cooker needs for a water level, so it is not like I add extra water. This is why I have a cooker, I’d be way confused otherwise. Way. Combine all ingredients EXCEPT lemonpepper in saucepan. Cover pot and allow to simmer slowly for 20 minutes, or until liquid is absorbed. Sprinkle with lemonpepper before serving. I have a little bit less steps, since I let the rice cooker do the work, but it is essentially the same. After that, I followed a bit of advice from a cool person I know. Ackley is on this raw foods diet. It seems to have done wonders for her, with lots of pictures to prove it. It is basically an attempt to eat less, cooked and processed food. So I decided to go with some fresh-ish carrots and broccoli with some ranch dip (I need dip for those, for cereals). 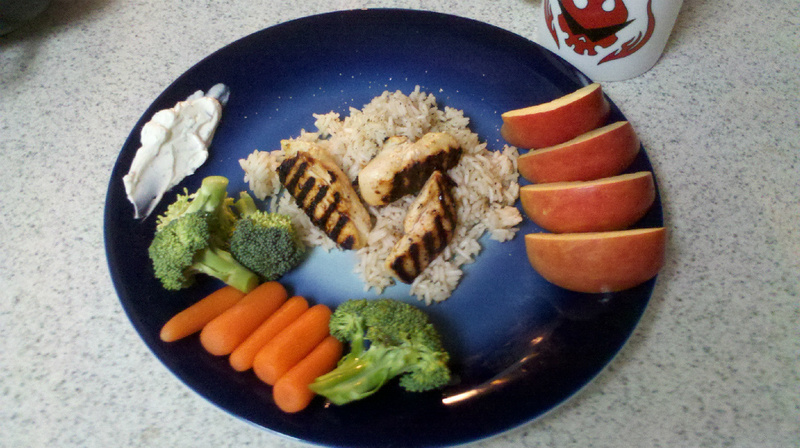 Threw in half an apple, mostly because I only had one and wanted an apple for the next day as well so I compromised. Worked out well since this ended up being a lot of food. 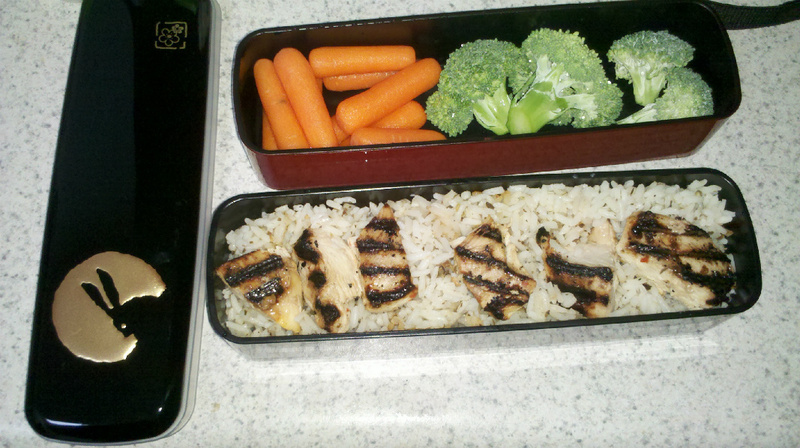 The image is only half the rice and grilled chicken that I prepared. It seemed like enough for me. So this may very well work out was as a recipe for two. I don’t have two, so I will have to settle for two days of meals. 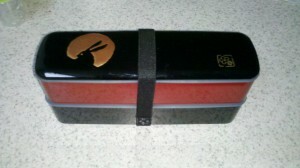 I got to test out my bento box I got awhile ago. It mostly fit all snuggly inside. I had to leave the apple out, but worked like a charm at work. Now I have something tasty and unique to take to lunch. Hurray! Sometimes I wish I cooked and the rat of the time I just admire other’s skills. You has skills, mow. Cooking is lots of fun. Just have to be patient and let the spice flow!